With online trading you have the fantastic opportunity to be your own boss, decide which hours you are going to work and from where and eventually make money without the cap that is placed on salaries. However the risks involved are high and for a beginner it is hard to understand how the markets works. There are so many news coming from the markets that can make everyone feel that we are constant beginner in a continuous learning stage. For this reasons many are afraid to make that important decision and become full-time traders. Let’s say one thing: everyone can start making money by trading in the markets with just a basic understanding of how the markets works. A decent starting capital is needed and also the right trading platform and tools. With the technology that has evolved so much in the last years you can trade using bots, trading algorithms, AI and social trading: those tools will allow you to find very good market opportunities without the need of having advanced degrees or specialised training. Here at TopTradingPlatforms.co.uk you will find all the most important guide to start trading efficiently in short time and what is required for you to improve your style overtime. What kind of trading are available? Stock Trading: in stock trading you can buy, holding and selling stocks (that are also called shares) of securities that are listed on the public stock exchanges like NASDAQ, NYSE and AMEX. Forex trading: Forex trading also called FX trading or currency trading is the trade that takes place in the currency. Basically traders in this sector buy and sell currencies in the hope of making a margin on the difference in the value of those currencies that continuously change on a daily basis. Options trading: this is a form of derivate trading. Traders trade contracts that give them the opportunity (but not the obligation) to buy or sell an asset at a price that has been predetermined. Binary options trading: when you trade on binary options you expect to make a margin based on the success of the ‘prediction’ of the outcome of a specific market event. For example you can buy if you think the asset price will go up or you can sell if you believe the asset price will fall. If the markets moves in the direction you have indicated you will make profit. How to make your first trade? Now that you understand the different ways the market works, you will need to make a decision on the type of asset or security that you want to trade. After that the next step is picking the right broker and trading platform which will allow you to enter the markets. The broker choice is a really important one as it will impact everything: from the type of securities you will be able to trade, the trading tools that you will be able to have, how much investment you would need to put upfront and how much fees you are going to be charged for your trading activity. It is important to get the broker and the trading platform spot on: some brokers are less transparent and tend to make their trading process very confused and complex. They do so that they can add more fees, commissions and transaction costs to beginner traders. So it is really important that you find a broker that will charge low fees but that will still provide you with very good tools so that you can make the most from your trading and also avoid that all the profits will be affected by huge charges. 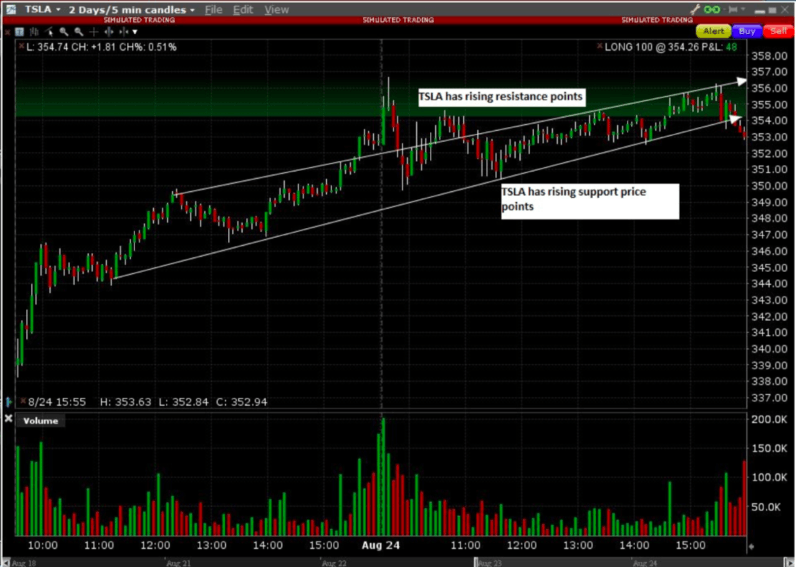 In the screenshot above we have done an example of a trade: in this case you are going to buy 100 shares of Tesla Motors Inc (NASDAQ:TSLA) at $354.25 per share. 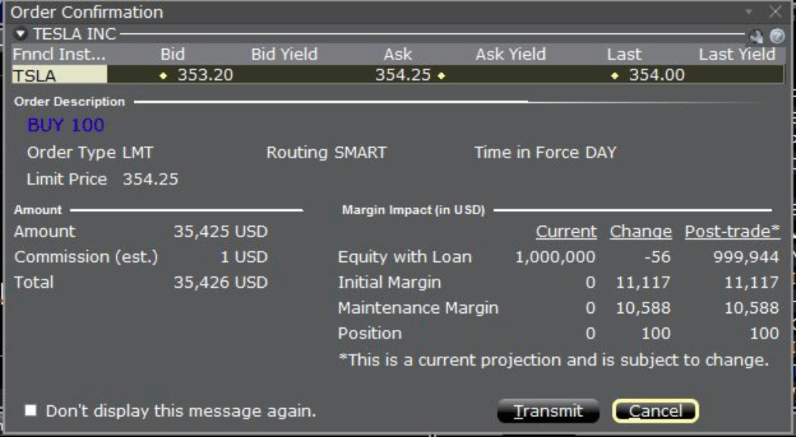 In this trade you can see that the commission is $1 and the total cost of the trade will be $35,346. How to develop a trading strategy? First of all you need to understand the difference between trading and investing. When you are trading you are actively seeking out market movements with a profit aim. An investor instead normally is looking to profit with long-term price movements in the assets in their portfolio. A trader therefore will make lots of trades (in the region of tens or hundreds) during a single week while investors will retain the asset for months of years. When you trading is important that you have a clear strategy that you will follow consistently. The first step when starting trading is therefore have a clear trading strategy as this is equal to writing a business plan for an entrepreneur. A trading plan will help you making logical decisions when there are rapid market movements and to keep away your emotions that might lead you to make rushed and potentially very dangerous decisions. In your trading strategy you will include a market ideology – you will set a goal (going out of debt, early retirement, making a million) and those will be your base motivating factor that you will look forward in the market. In the trading strategy you should also include your asset allocation and diversification moves. As a beginner for example it is advisable to not have more than 5% of your trading capital in any single trade. But let’s do a practical example. The chart we have inserted above show that Tesla have been growing consistently: in this case the stock is trending because of something happen like a new product launch or a sudden change in management. The period considered in the chart is 3 weeks. By looking at the stock chart you can get a better idea of what you need to do: for example you should hold/buy more shares if you believe that Tesla uptrend will continue. However if you believe Tesla is peaking uptrend than you should sell immediately your shares to lock the profits that you have made. In your trading strategy you should determine some risk limits such as how much money you can lose in a trading session (this shouldn’t be more than 5% of your total capital) and how much loss you can afford to book in each trade (normally shouldn’t be more than 1% of your trading capital). Also in your trading strategy you should have a mix of fundamental analysis (for example global events like wars that could impact oil prices) and technical analysis (trading rules based on price and volumes). With those information you should than determine your entry into trades and when you need to exit if the market moves in your favour. In the same way you should determine when to go out when the trade goes against your plans. Having a good discipline to stop/limit loss will help you long term to avoid potentially horrible situation where all your capital will be at risk. How to use technology to beat the learning curve? With the help of technology also new traders can make very good profits from the markets even with limited experience. The entry barrier to trading has been lowered significantly by automating lots of activities that will otherwise require a great deal of mental effort to track. Below we have analysed what are the tools that can help you run while you learning to walk. If you are trading stocks finding the right stock might be a difficult decision as there are so many around. Many will go with the ‘big name’ stocks that make headlines while others will try to find those ‘quiet’ stocks that can provide consistent longterm gains. One thing is pretty simple to understand: if you just trade stocks based on the news than you will probably miss the big profits. The trick to make big margins is to go in or out of the trades before it hits the headlines. A stock screener can help you in this as it will analyse thousands of stocks in the market to select the potential winners just before their big break. In this way it will allow you to see top gainers and losers, stocks that are overvalued and stocks that are about to break out above resistance or break down below support lines. Lots of brands like MarketWatch, Google and so on offers free stocks screening software and you can also find some with your broker that might be integrated into your trading platform. 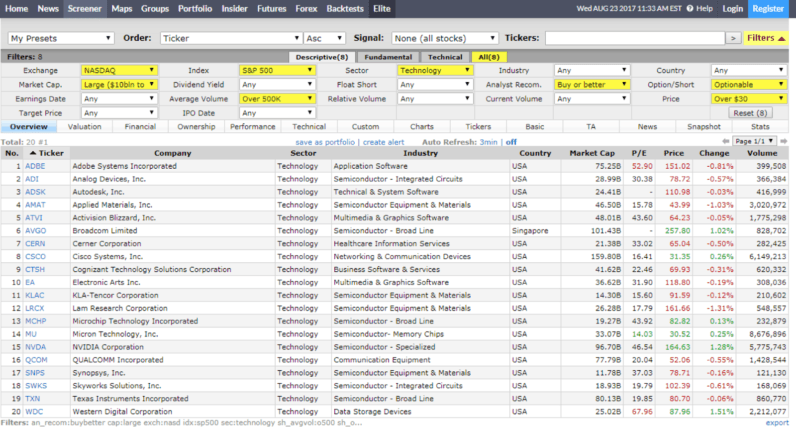 In the screener below you can see that we have set it up to show stocks trading on Technology stocks with a share price of at least $30 per share and a market cap of at least $10B. It is also set to spot an average trading volume of more than 500K trades on the NASDAQ exchange. The stock also would need to be optionable (you can buy or sell its options) and has to have an analyst rating of ‘Buy or Better’. Another useful advantage for beginners and experienced trading of the technology are trading bots. Those bots are basically some computer programs that have instructions to execute a trade for you when certain conditions will happen in the market. You can use automated trading bots to trade stocks, options, futures forex: you will need to set a predefined set of rules which will tell the bot when to enter and exit a position and how much you are willing to invest in each trading product. Trading bots are a great tool to improve the odds of success of beginners traders as effectively they reduce the gap due to inexperience. One you have set them up they will make sound trading decisions and will not be emotionally involved similar to what might happen to a newbie trader. In addition to that they will reduce your direct involvement in the market as you will have someone that is acting and watching your portfolio in your absence. So even if you are doing something else your bot will be looking for opportunities to make some profits in the market. The best way that trading bots are helping beginner traders is that they have a set logic and they make decisions based on fact. One of the biggest risk for an inexperience trader is that emotions and sentiments will cloud the reasoning and this is taken away by using trading bots. It is also important to notice that trading bots are not only made to improve your profits but also to limit your losses when things are going in the wrong direction. Many beginners tend to confuse trading bots with algorithm trading. Don’t do that as they are completely different. Algorithmic trading is simply a tool that is made to help traders execute orders automatically based on some instructions like price, volume and timing. 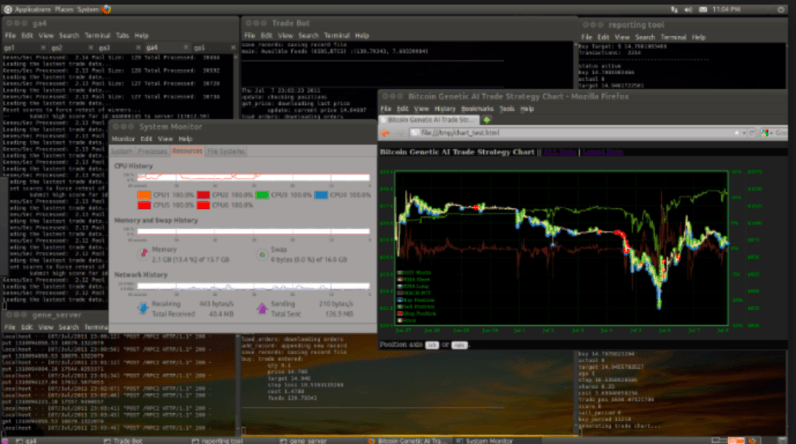 Algorithmic trading can also be used to break down large orders and avoid execute them in a single trade. So with algorithmic trading you can manage costs and reduce risks. Those can also help institutional investors or individual investors with significant resources to avoid spooking the markets. Another option that surely can benefit beginners to reduce their trading learning curve is to use social trading. But what it is social trading? Basically is a type of trading where traders rely on other successful traders and follow them in their decisions. Social trading provides you the platform to be part of a big community of successful traders and get some significant profit if you pick the right one! Social trading is simply a type of trading in which traders rely on user-generated financial content, collated from a variety of networks, to make trading decisions. Social trading provides you the platform to be part of a community of successful traders so that you can distill the wisdom of the crowd to make trading decisions. In this case you exactly copy their decisions and hope they have done well. What are the common mistakes trading beginners should avoid? Since new traders are keen to enter the market immediately they forget to draw a trading plan. It is a fact that entering the market without a well thought-out trading plan will likely to result in huge losses. This is because you will most likely reacting to events in the market rather than following a trading logic. Using a trading journal is really important as you will be able to analyse the results of the trade and check how your thesis pan out in reality. With a trading journal you will also do a quick post-trading analysis which will prepare you for the next trade. Some traders will begin with some gains but others traders will start by losing money at the beginning due to some trading mistakes. You should avoid changing strategy everything you experience a loss as this will only set you back on the trading curve. Every strategy, as good as this can be, will have bad days and good days and surely is good idea to keep adjusting and learning but completely changing the trading strategy everytime something goes wrong it is not advisable. 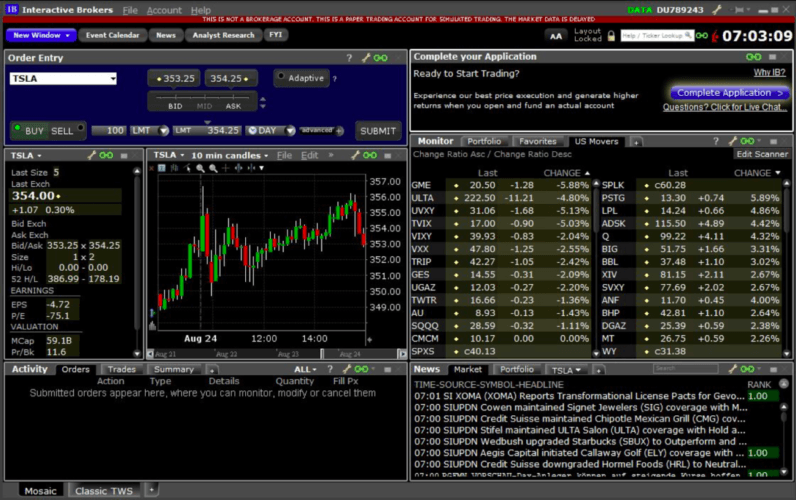 Now you have some actionable information to start your trading journey. We believe education is really important so make sure you bookmark this section as we will have new guides coming up regularly where we will further explore all the topics of trading online! Good luck with your trades.